U.S. President Donald Trump is pushing his trade conflict with China toward a point where neither side can back down. By Aug. 30, as the U.S. nears mid-term elections vital for Trump’s legislative agenda, the White House will be ready to impose 10 per cent tariffs on US$200 billion of Chinese-made products, ranging from clothing to television parts to refrigerators. The levies announced Tuesday — together with some US$50 billion already in the works — stand to raise import prices on almost half of everything the U.S. buys from the Asian nation. China has seven weeks to make a deal or dig in and try to outlast the U.S. leader. President Xi Jinping, facing his own political pressures to look tough, has vowed to respond blow-for-blow. He’s already imposed retaliatory duties targeting Trump’s base including Iowa soybeans and Kentucky bourbon. Yet matching the latest U.S. barrage would force China to either levy much higher tariffs or take more disruptive steps like cancelling purchase orders, encouraging consumer boycotts and putting up regulatory hurdles. Not only does that risk provoking Trump to follow through on threats to tax virtually all Chinese products, it could unleash nationalist sentiment on both sides that fuels a deeper struggle for geopolitical dominance. Stocks fell, the dollar gained and commodities slid with emerging-market assets Wednesday as investors assessed the fallout. Futures on the S&P 500 were down 0.6 per cent as of 7:14 a.m. in New York and the Stoxx Europe 600 Index retreated 1.1 per cent. While earlier tariffs were expected to have only a limited impact, economists warn a full-blown trade war could derail the strongest economic upswing in years. The Chinese Commerce Ministry said Tuesday that it would be forced to retaliate against what it called “totally unacceptable” U.S. tariffs. There have been no confirmed high-level talks between to two sides since early an early June visit to Beijing by U.S. Commerce Secretary Wilbur Ross that achieved no breakthroughs. The latest move suggests that Trump — who in March declared that “trade wars are good and easy to win” — may be compromising on his pledge to spare consumers from the pain. The tariffs could raise the price of everything from baseball gloves to handbags to digital cameras just voters are heading to the polls. Other high-profile items such as mobile phones have so far been spared. The U.S. felt it had no choice, but to move forward on the new tariffs after China failed to respond to the administration’s concerns over unfair trade practices and Beijing’s abuse of American intellectual property, according to two senior officials who spoke to reporters. The Trump administration has so far rejected Chinese offers to trim its massive trade surplus by buying more American goods, and is demanding more systemic change. Although the looming elections provide an immediate concern for Trump, a trade war poses a more existential concern for Xi, whose Communist Party has built its legitimacy on economic success. Prominent academics and some government officials have begun to question if China’s slowing, trade-dependent economy can withstand a sustained attack from Trump, which has already weighed heavily on stock prices. Among other things, the U.S. is asking China to roll back its “Made-in-China 2025” program, a signature Xi initiative to dominate several strategic industries, such as semiconductors to aerospace development. Since abolishing presidential term limits, Xi has strengthened his control over the levers of power and money in China and can’t afford to look weak. –With assistance from Jenny Leonard , Andrew Mayeda and Bryce Baschuk. In an interview with CNBC broadcast this morning, Trump said "we're down a tremendous amount," referring to the trade imbalance between the US and China. "I'm ready to go to 500." He said the United States is "being taken advantage of, and I don't like it." Trump's views on issues such as guns and abortion have shifted throughout his public life, but on trade he has been a consistent protectionist, dating back to the 1980s. That kind of direct criticism breaks with a longstanding tradition that presidents refrain from even commenting on Fed policy While it is part of the U.S. government, the Fed is considered to be independent, keeping it free from political pressure. 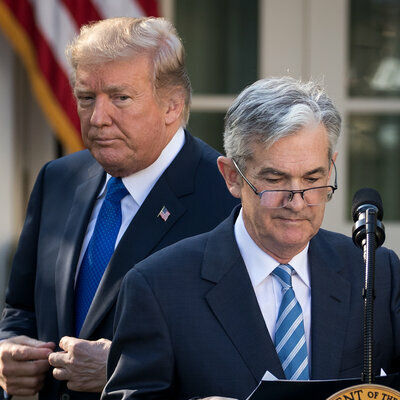 But Trump was back at it this morning in a tweet that again slammed the Fed's monetary policy: " ... Tightening now hurts all that we have done. The U.S. should be allowed to recapture what was lost due to illegal currency manipulation and BAD Trade Deals." He’s only voicing a widely shared resentment about Chinese double-dealing in economic policy. 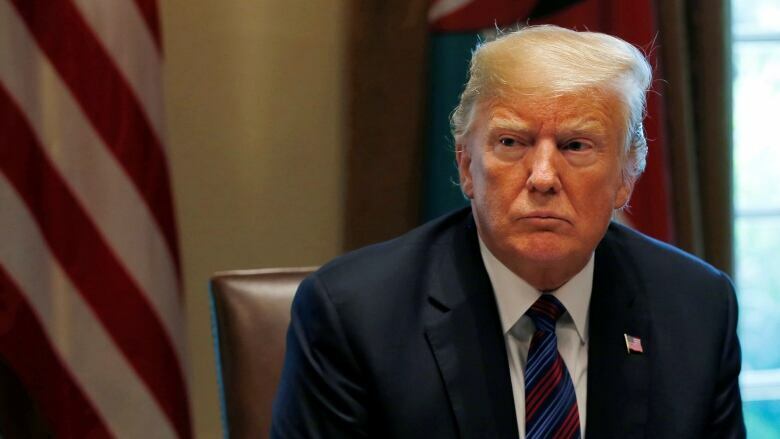 U.S. President Donald Trump's declaration of victory Monday in reaching a preliminary deal with Mexico to replace the North American Free Trade Agreement raised at least as many questions as it answered. And will the changes being negotiated to the 24-year-old NAFTA threaten the operations of companies that have built sophisticated supply chains that span the three countries? "There are still a lot of questions left to be answered," said Peter MacKay, former minister of justice, defence and foreign affairs, who is now a partner at the law firm Baker McKenzie. "There is still a great deal of uncertainty — trepidation, nervousness, a feeling that we are on the outside looking in." Trump was quick to proclaim the agreement a triumph, pointing to Monday's surge in the stock market, which was fuelled in part by the apparent breakthrough with Mexico. The clip we tried to show you isn't available. "We will only sign a new NAFTA that is good for Canada and good for the middle class," said Adam Austen, a spokesperson for Freeland, saying "Canada's signature is required." "Let's make a great deal like we just made with Mexico," Kudlow said. "If not, the U.S.A. may have to take action." Critics denounced the prospect of cutting Canada out a North American trade pact, in part because of the risks it could pose for companies involved in international trade. Many manufacturers have built vital supply systems that depend on freely crossing all NAFTA borders. Noting the "massive amount of movement of goods between the three countries and the integration of operations," Jay Timmons, president of that U.S. National Association of Manufacturers, said "it is imperative that a trilateral agreement be inked." Trump has frequently condemned the 24-year-old NAFTA trade pact as a job-killing "disaster" for American workers. NAFTA reduced most trade barriers between the three countries. The president and other critics say the pact encouraged U.S. manufacturers to move south of the border to exploit low-wage Mexican labour. The U.S. Congress wouldn't vote on it until next year — after November midterm elections that could end Republican control of the House of Representatives. But initially, it looks like at least a tentative public relations victory for Trump, the week after his former campaign manager was convicted on financial crimes and his former personal attorney implicated him in hush money payments to two women who allege they had affairs with Trump. Even a key Trump ally, Rep. Kevin Brady, the Texas Republican who chairs the House ways and means committee, expressed caution about Monday's apparent breakthrough. Brady said he looked forward "to carefully analyzing the details and consulting in the weeks ahead to determine whether the new proposal meets the trade priorities set out by Congress." There are political reasons to keep Canada inside the regional bloc. "Mexico will have a difficult time selling 'Trump's deal' back home if Canada does not think it is a good deal," said Daniel Ujczo, a trade lawyer with Dickinson Wright PLLC. "It will appear that Mexico caved." The Office of the U.S. Trade Representative said Mexico had agreed to ensure that 75 per cent of automotive content be produced within the trade bloc (up from a current 62.5 per cent) to receive duty-free benefits, and that 40 per cent to 45 per cent be made by workers earning at least $16 an hour. Those changes are meant to encourage more auto production in the United States. For months, the talks were held up by the Trump administration's insistence on a "sunset clause": A renegotiated NAFTA would end after five years unless all three countries agreed to continue it. Mexico and Canada considered that proposal a deal killer. On Monday, the Trump administration and Mexico announced a compromise on that divisive issue: An overhauled NAFTA would remain in force for 16 years and would be reviewed every six years. White House trade adviser Peter Navarro on the trade deal reached between the U.S. and Mexico. President Trump announced a tentative trade deal with Mexico on Monday. 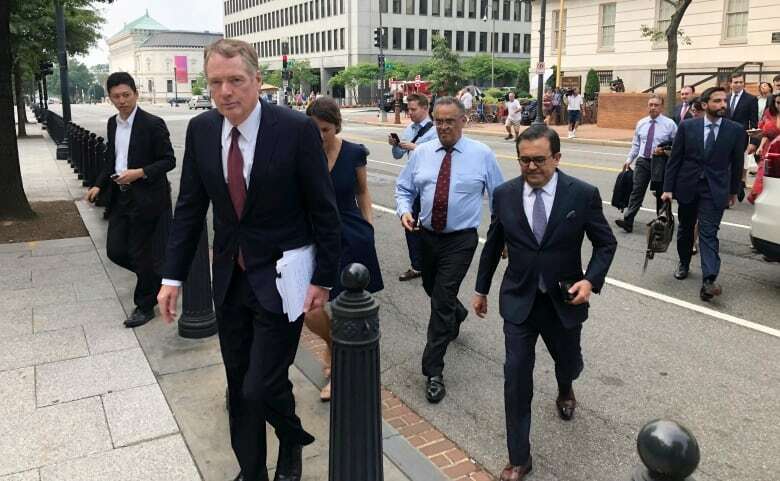 Navarro believes the deal will bring back auto parts and the auto industry from the rest of the world, which he says has been stealing it from both Mexico and the United States. “This is a rebalance that works for both countries that is the beauty of this deal and Detroit should be very happy tonight along with the rest of the country,” he added. Navarro says a key part is protecting intellectual property. Navarro says at the root of the agreement is solidifying the manufacturing base and supply chain. He believes the deal will appeal to congressional lawmakers on both sides of the aisle.